Alan the Alligator prides himself on being the scariest creature in the jungle. Every day, he sneaks into the jungle to terrorise the other animals. But Alan has a deep secret: his teeth are false. After the secret gets out, Alan is the laughing stock of the jungle, and he certainly isn’t scary anymore. After some clever negotiating by the other jungle creatures, Alan manages to get his teeth back and discovers a new way to fit with the other animals. 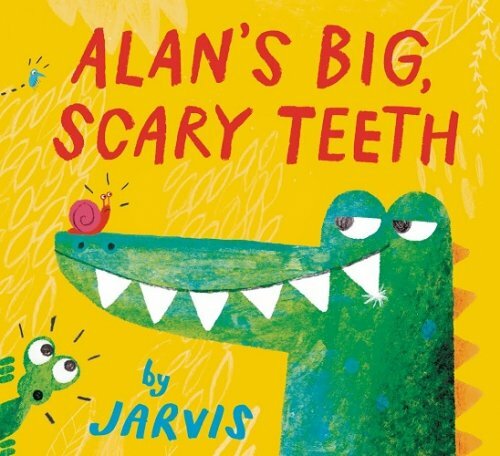 Alan’s Big Scary Teeth is a witty and charming story which is sure to get some toothy grins from the little ones. It can be used to teach children about friendship, negotiating, empathy, and could even be an excellent choice to discourage biting behaviour! Children will enjoy identifying obstacles to Alan’s actions (e.g., “why isn’t he scary anymore?”) and brainstorming ways that Alan could get his teeth back. For further speech and language targets in Alan’s Big Scary Teeth, see the list below.